Even the hippest bachelor pad needs a few soft touches! 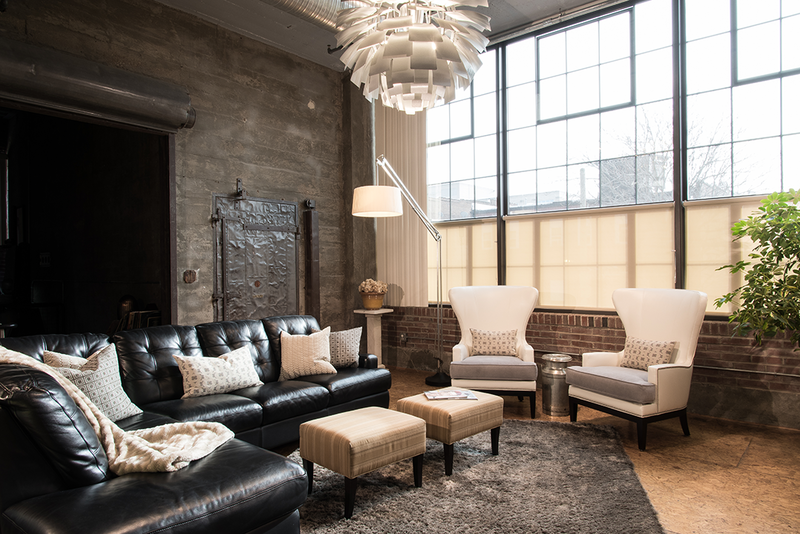 Exposed brick, raw concrete walls, polyurethane subfloors and a steel door leading to nowhere – need we say more? 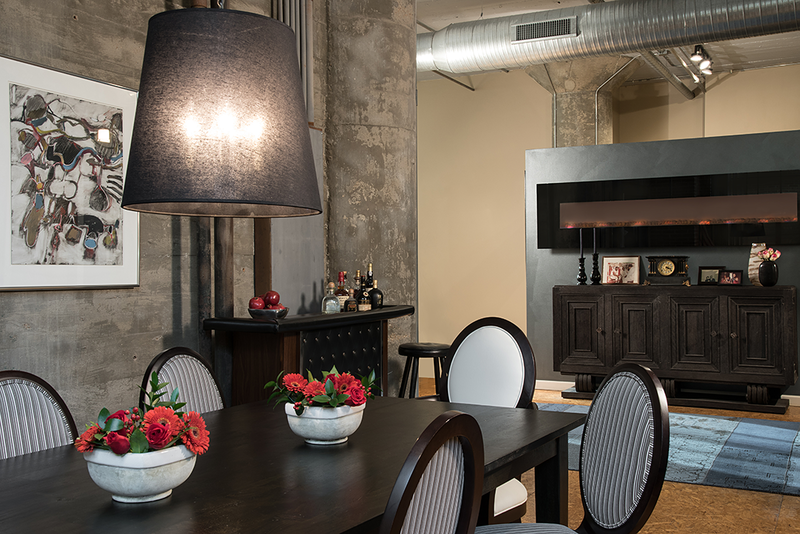 It was the industrial look that drew Michael Henderson to his 3,000-square-foot home in an eight-story commercial-turned-residential building that opened as Sporting News back in 1923. Henderson brought on designer Tamsin Mascetti of the award-winning Tamsin Design Group because, he says, “She has the ability to do traditional design in a very creative way.” The unpolished space turned out to be a perfect backdrop for a living-dining combo that’s both contemporary and calming. “I wanted to create a chic look that blended my client’s modern tastes and eclectic style,” Mascetti elaborates. Off the bat, she traded the existing unit’s orange-and-beige hues for a cooler palette of rich blues, grays and cream designed to contrast with the floors and metal accents. The first design element Mascetti chose was that mod Louis Poulsen PH Artichoke Pendant hanging in the living room. The designer fixture is always getting complements, with its wet, painted-white finish, feminine shape and unusual glow. “It demanded a masculine counterpart,” Mascetti says. Hence, the oversized leather sectional underneath, adorned with gray and cream geo pillows and two striped custom footrests that double as extra seating. Now it was time to add some serious warmth – literally. Henderson says Mascetti gets the credit for what he calls his 100-foot fireplace. “Everything I saw was small, and I wanted this ginormous fireplace that we could put way up high,” Henderson elaborates. Underneath, a mocha credenza for dishes, blankets and photos amps up the comfort level; so does a custom gray silk-shag area rug. Large and funky Kellex chairs frame impressive 16-foot windows overlooking Schlafly Bottleworks. Creamy roller shades afford Henderson some privacy, while letting light in. Those rays flow all the way into Henderson’s dining area, featuring an expanding dark walnut table and custom Kellex round-back chairs in a masculine stripe by Wolf Gordon that was inspired by the Ernest Trova print hung behind them. For tactual interest, Mascetti put down an ABC Carpet & Home vintage patchwork rug sewn of various pieces of over-dyed kilim rugs. Henderson scooped his vintage bar himself from an antique store; along with a sheer-black pendant from Restoration Hardware, the piece establishes a sophisticated atmosphere. “I knew my client wanted a statement piece, so I searched for something as unique as his style,” says Mascetti. 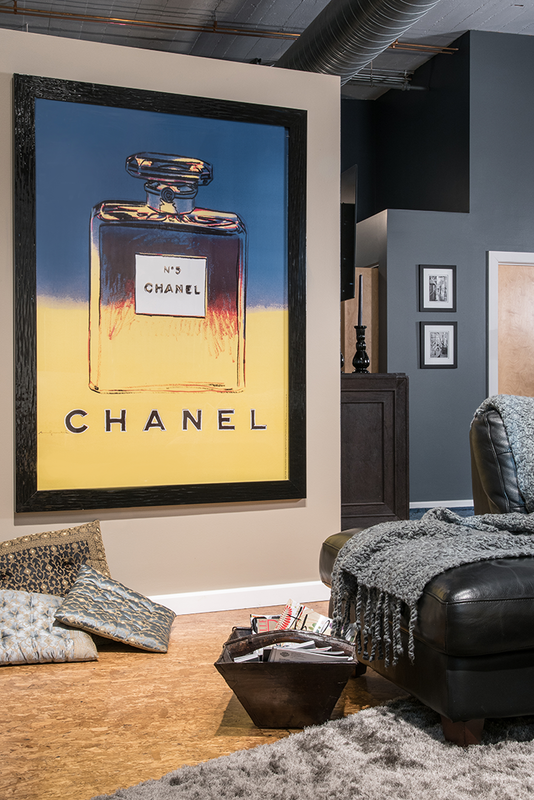 She nailed it with one amazing finishing touch: the original, vintage Warhol Chanel bottle poster, sourced through a dealer in Chicago. “With it's saturated blue-yellow colors, it was the perfect fit,” Mascetti adds.